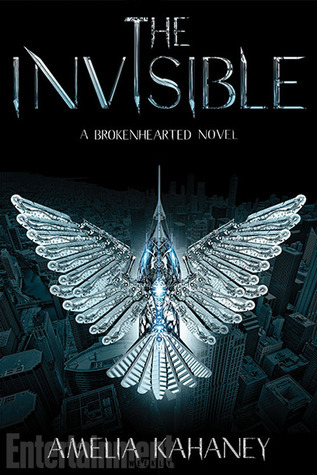 Presenting Brokenhearted #2 The Invisble by Amelia Kahaney. Following the events of the first book. Anthem Fleet is finally growing into her abilities. In the first book she had lost her human heart in an accident and got an experimental "chimera" heart transplanted by by Jax, the black market scientist. Her supposed boyfriend of last season, Gavin is very much dead. The syndicate is lying low after loosing their highest player (in the form of Gavin) and bidding their time. But Bedlam City is still a great cesspool of activity and another enemy rears their ugly head. A group called "The Invisible" (coincidentally the title of the book) are the enemy number 1 and they seem to hold an iron-clad grudge against the Northsiders, and are engaging in 'deadly pranks' to met out their judgement. Flash-backs provide a look into Bedlam during the time of the "Hope", connecting the dots between that person and the "New Hope". How Bedlam City became so divided and the syndicate came into power. Reading the first book had made me think of this series as nothing but a Gotham/Starling City spoof, and Anthem Fleet taking up the mantle of the heroine as nothing but the rip-off off Batman/Arrow. But since then the characters have grown on me. Anthem Fleet felt rather stupid first time round with her reasons of becoming the "New Hope" but not anymore. While she still relies on her speed to keep her identity a secret, she still trusts too readily. Well Rome wasn't built in a day so changes will be gradual. The plot for the sequel is also well structured. The first time round it felt more like an experiment. A trial run. But "The Invisible" boosts a great plot, much better layered background development, evil villains, great action and better character development. And I must point out that the romance between Anthem and Ford was well done. Much better than how it was with Gavin. Come on can't even remember what happened then, details are still sketchy to me. Thus, out with the old, in with the new. But yes i'd say it again, I was hesitant about it at first but the sequel was a much better read than the first. "A much better action packed sequel and even meaner villains to tackle"